Apparently long red dresses are the things to wear in the Mediterranean these days. They're preferable to the tight short shorts you see in the news anyway, but not very interesting otherwise. The model in the photo looks good with all of the add-ons, but when you are on a beach vacation, who cares? 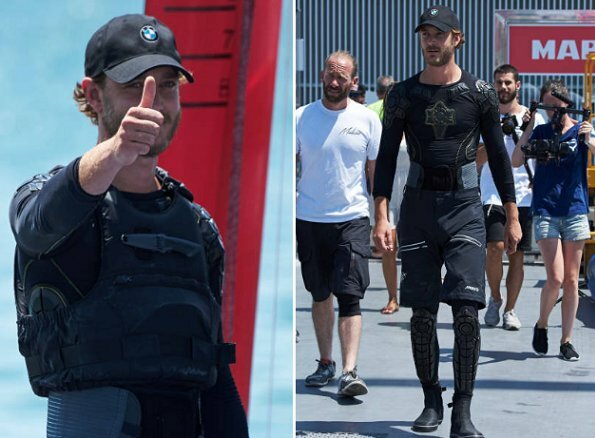 La tenue de Pierre Casiraghi tient plus de la Guerre des Étoiles que de la marine à voiles . What in the world is Pierre wearing on his legs? It looks like stockings!